The holidays are a special time for the entire family- and that goes for your pets too! I know there’s lots of potential for stress, and your pet is not immune to it either. Whether your pet is one who loves being the center of attention during the holiday festivities, or they are shy and just want to seek shelter from the tail-pulling toddlers- we want to ensure that your pet enjoys the holidays with your family and not adding stress to a joyful time. As you probably know, there’s a wide variety of foods that can be disastrous if your pet gets into them. Many of these foods are common ingredients around the holidays. Care should be used during prep, cooking, cleaning and dining to make sure your pet does not eat what they shouldn’t. The Pet Poison Hotline has done a good job in summarizing some of the top food hazards for your pet. Fatty foods such as butter, bacon, fatty meat drippings, gravies and meat scraps may seem harmless but can pose very real threats of pancreatitis. Pancreatitis is an inflammation of the pancreas that can result in clinical signs of vomiting, diarrhea, loss of appetite and abdominal pain. Some breeds, such as miniature Schnauzers are very prone to developing pancreatitis but all dogs ingesting a large enough quantity of these foods are at risk. Symptoms may not be immediate and can occur up to 4 days after exposure. Discarded food items such as corn cobs, discarded turkey trussing’s, and bones can result in an obstructive risk or gastrointestinal injury that have the potential of requiring surgical removal or repair. Turkey Brine: Who would have thought that the recently popular trend of brining your turkey prior to Thanksgiving would be a risk to your pets?! When you remove the turkey, this salt-saturated solution can be very attractive to dogs and cats, who will readily lap it up resulting in salt toxicosis. Clinical signs are excessive thirst and urination, vomiting and diarrhea. This can potentially result in serious electrolyte changes and brain swelling. Xylitol: Candies, desserts or other foods that are sweetened with an artificial sweetener called xylitol are dangerous to pets. Xylitol can result in a rapid drop in blood sugar in dogs along with liver damage. In the past, we saw xylitol limited to the ingredient lists of sugar-free gums, mints, and dental products but xylitol is now very commonly used in sugar-free or low-sugar baked goods, vitamins and even peanut butter! Even quantities that appear to be very small have the potential to quickly become life-threatening to dogs. Always check the label! 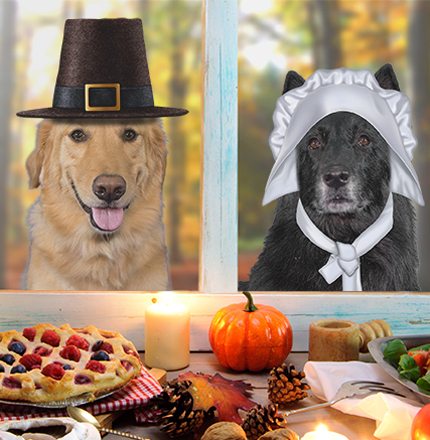 Raisins, currants and grapes found in some of our favorite Thanksgiving foods are a very serious concern for dogs as they have the risk of resulting in acute renal failure with even small ingestions. Onions & Garlic are also to be avoided for both dogs and cats. Onions contain an ingredient called thiosulphate which is toxic to cats and dogs. The ingestion of onions causes a condition called hemolytic anemia, which is characterized by damage to the red blood cells. Onion toxicity can cause the red blood cells circulating through your pet’s body to burst. Chocolates in our desserts or treats are dangerous to our pets. Remember that the darker the chocolate, the more serious the ingestion, and the less they will need to ingest to develop clinical signs of vomiting, diarrhea, agitation, tremors, increased heart rate along with potential seizures. Holiday decorations are a concern for many reasons. The bouquet of lilies you received from your guests can result in acute renal failure in your cat. Bittersweet flowers are many times included in fall floral arrangements and can cause gastrointestinal upset. Candles can result in burns and flameless candles contain batteries, that when ingested can result in gastrointestinal burns and corrosive injury. One item which is not mentioned by the Pet Poison Hotline is alcohol. It goes without saying that you should never give your pet alcohol, or leave cups or glasses with alcohol unattended around curious pets. If you’re hosting a holiday meal for friends or family- make sure they know the rules about feeding table scraps. The rule is ‘don’t do it!’ Be friendly, but firm on the matter, especially with small children who want to befriend your pet with tasty morsels from their plate. For those of you with larger breeds, be vigilant about where food is kept unattended on counters or tables. If you’ve ever seen “A Christmas Story” you’ll remember the scene where the family dog devours the entire Christmas turkey, forcing the family to have Christmas dinner at a Chinese restaurant. I’m pretty sure you don’t that to happen. When you’re finished with your meal and all of the table scraps are going into the trash- make sure that your trash can is secured. Even the most obedient pets are tempted by the wastebasket, which can end up in disaster if your pet gets into it. The steady stream of family and friends entering your home causes a lot of excitement for your furry friends. If your pet is excited to greet everyone each time the doorbell rings, make sure they are restrained with a leash so they don’t go running out the door. Alternatively, keep them secured in another room or in a crate until all of your guests have arrived. You don’t want to be chasing your pet around the neighborhood when you should be enjoying time with family and friends. Explain to your guests that care should be used when opening any exterior doors, and to close them promptly. If your pet has a microchip, now is a good time to double check that the microchip company has all of your current information on file. You would be surprised at the number of wayward pets that are brought to Tampa Vet who have a microchip, but we cannot locate the owners due to outdated microchip information. If your pet does not have a microchip, we suggest getting one. For more information on microchipping your pets, check out my earlier blog on this topic. If you’re planning on heading out of town with your pet, make sure your pet is prepared. I’ve offered up lots of travel tips in a previous blog which can be found here. 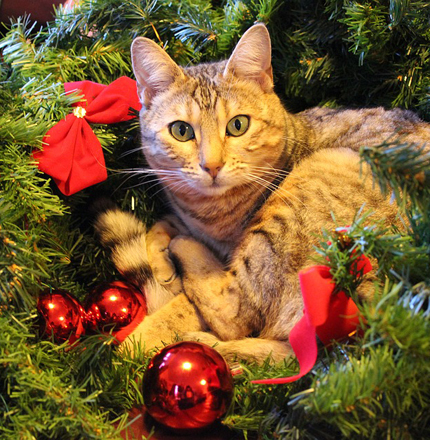 Have any other concerns about your pet as we head full-steam ahead into the holiday season? Give us a call and we’ll do our best to answer them. We want you and your pets to have a happy and safe holiday season! We Know You Love Your Pets. You Will Know We Do, Too.